Korea held Chile to a 0-0 draw in a friendly in Suwon, Gyeonggi Province on Tuesday. 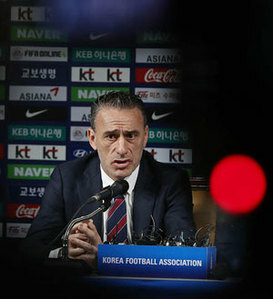 It was the second match under the leadership of Paulo Bento, the head coach of the national football team, after a friendly against Costa Rica last Friday, which Korea won 2-0. About 40,000 spectators packed the stadium and gave the team warm and heavy applause. Chile is a strong team, ranked No. 12 in the FIFA world rankings, much higher than Korea's 57th. It won two consecutive Copa América titles in 2015 and 2016. 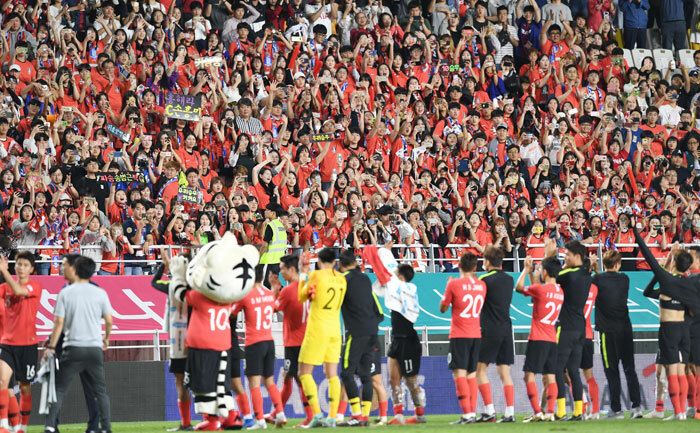 Korean footballers wave at fans after a friendly against Chile in Suwon, Gyeonggi Province on Tuesday. Korea's starting lineup included attackers Hwang Hee-chan, Hwang Ui-jo and Son Heung-min, who played key roles in securing the gold medal at the recently ended Asian Games in Indonesia. Chile pressed hard from the start, with star midfielder Arturo Vidal of FC Barcelona making outstanding passes. Korea managed to withstand the Chilean attack, with captain Son, who played the full 90 minutes, actively joining in defense. Bento substituted Ji Dong-won and Lee Jae-sung for Hwang Ui-jo and Nam Tae-hee in the second half. He seemed to want to try different combinations of attackers rather than focusing on defense. Korea missed its best scoring chance of the match in the 68th minute when defender Jang Hyun-soo's header missed the post by inches. "It was a difficult match as expected, but we had a tight game against a strong team," Bento said after the match. "We will be able to continue to show improvements down the road."